Vegetarian Frugal Housewife » Blog Archive » Pasta, Made of Corn? So today was my first try of corn pasta. The last attempt at non-wheat pasta was disastrous and, well, disgusting. That was back in May and I will not be buying that Bionaturae wheat-free variety again. It was a mixed flour pasta with soy, rice and potato and the result was a rather slimy, not-very-pasta-like pile of stuff. 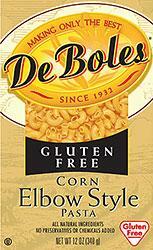 Tonight we had corn pasta by DeBoles along with regular Prego spaghetti sauce and Nate’s Zesty Italian meatless meatballs. The corn pasta was wonderful! It was a yellowy color but tasted exactly like regular pasta and, though it took a bit longer to boil and made the water an interesting cloudy white, it came out the exact same texture that one would expect of wheat-based pasta. Having been a vegetarian for a only a short time now, I was also pleasantly surprised at the quality of the meatballs. Very meaty in flavor and relatively natural in ingredients. I will be attempting a veggie meatloaf soon and hope that it comes out half as good as those frozen meatless meatballs that we picked up in the Stop-n-Shop natural foods section. the only wf pasta that i have found to be tolerable is the tinkyada brand. it’s brown rice pasta and quite delicious. the fusilli is fantastic for noodle soups. the only down-side is you don’t want to cook more than you’ll eat in one sitting (unless it’s in soup).